Over the decades music lovers around the world have had the luxury of hearing many legendary bands rise to glory in the music industry exported from Britain. It really is surreal when you actually sit back and look at how many musicians came from the United Kingdom. Uriah Heep is one of those legendary bands and they are still making musical masterpieces to this day. ‘Wake the Sleeper’ is the title of their latest album and it is by far in my opinion one of their greatest records to date. This fine group of musicians has inspired and influenced so many of today’s bands and musicians in so many different ways. Uriah Heep consists of Trevor Bolder (bass & vocals), Phil Lanzon (keyboards & vocals), Bernie Shaw (lead vocals), Russell Gilbrook (drums & vocals) and Mick Box (guitars & vocals). Starting his musical career in the late 1960s and forming Uriah Heep with vocalist David Byron; Mick Box has remained a strong driving force of the passion within the band. With 20 studio albums under their belts, Uriah Heep has returned with immense strength and an album that is going to awaken the sleeping metal head within you once again. I called Mick to ask him all about the new record as well as what we as fans can expect over the next year from the band. TFL: Mick! It’s Tracy with Backstage Live Magazine. MB: Hello my love, how you doing love? TFL: I’m good thank you! Thank you so much for taking to speak to me I appreciate it. MB: Well likewise love! Thank you very much for calling. (chuckling) It’s brilliant! TFL: You guys have always been one of my all time favorite bands, you started before I was born but I’ve always admired your music. MB: (laughing) Ah well at least we got to you eventually! (laughing) that’s brilliant, that’s absolutely brilliant! TFL: Blue Oyster Cult was one of the first rock concerts I ever saw. MB: Cool! Love those guys. TFL: I didn’t dive into the whole Motley Crue, Poison thing; I was really into the classic rock/metal like Sabbath, Priest, and Maiden you know. TFL: ‘Wake the Sleeper’ I’ve had the chance to listen to it – it’s absolutely fabulous! TFL: It’s by far, I think, the best album you have ever made. MB: Oh wonderful, that’s great news! Thank you very much Tracy that’s lovely. TFL: ‘Tears of the World’ has got really catchy hooks, I found ‘What Kind of God’ takes you in and it just grabs you from the minute it starts. MB: It’s quite atmospheric at the beginning of it isn’t it yeah. TFL: Can you tell me where the inspiration for that song came from? MB: Yes indeed yeah, it was from the book ‘Bury My Heart at Wounded Knee’ and both Phil and myself have read the book and I read it ages ago and he just recently read it. We decided it would be a good kind of subject matter to hit really basically because the whole story of the American Indian living on the land are very spiritual and then some guy comes along on a horse with a rifle & shoots and takes away your land and tells you what religion to worship and all sort of stuff is kind of …well if you were an Indian you would be thinking ‘well what kind of God do you worship’ you know. It’s kind of that kind of thing where they were spiritually in touch with something and then it was all taken away from them and it’s just kind of reflection on that. TFL: Now this is your first album in 10 years. TFL: Why such a long break? TFL: Well I got a press release about the new album and I think it was about a 30 second turn around for a YES YES YES reply for an interview with you – I had the instant ‘I got to have them” reaction. TFL: What I have always enjoyed about Uriah Heep is you have always been story tellers. MB: Yeah well we do like a good lyric, sorts of a band that can have that throw away hook line and no substance to any verses – we do take it very seriously and we try and get a good lyric as much as we can. TFL: Unfortunately there are a lot of artists out there where it’s really just no-mind music you know, it probably took them a whopping 3 or 4 minutes to come up their song. MB: Yeah yeah, we can’t write like that because it’s not in our nature to do that – there are things to be said and it’s nice to do that through lyrics. TFL: Are there any new bands out there that have caught your attention Mick? MB: Um, well Slipknot’s latest album is fantastic you know! There are a lot of bands around but I do tend to find, and I don’t know if it because of my background or if it’s because I’m from the 70’s my love is in the classic rock genre – all these guys play brilliantly but I can never find a song in there. Because I write songs I find that a bit frustrating cause there is some brilliant players out there – but I still yurn for the song. There is nothing better than a good melody and a strong lyric. TFL: Or a song that a music fan can relate to. MB: Absolutely yes. Also the great thing about lyrics you can think of one thing in your imagination and it can be different in mine you know. That is something that is very strong in my mind all of the time when we are writing. TFL: Do you think people will misconstrue ‘What Kind of God’ and think it’s about the whole Iraq deal going on? TFL: What is next for Uriah Heep? Are you heading out on tour to promote the album? MB: Absolutely! We’re playing 53 countries so we have got a lot of world to go and see. We’re looking to come to America and Canada in January/February. We’re trying to piece that together now. TFL: Please please please be sure to come to Calgary Mick – I must see you perform live again. MB: YEAH! The Calgary Stampede – yeah that was fantastic fun! (laughing) we had a great day all together. TFL: You didn’t get sick of pancakes? Laughing – EVERYDAY for 10 days there is pancakes! TFL: Well I certainly hope to see you Mick – I’d love to take you for lunch if you can. I know a fabulous restaurant here where I know the Head Chef –its Italian food & the BEST you will ever eat! MB: Italian food is my favorite – I’d love that Tracy that would be wonderful! Watch the website for dates to come up and we can organize that very quickly. TFL: Well it could be cold so bring your woolies! TFL: So when Mick Box is not guitarist and vocals for Uriah Heep – what are you doing Mick? What do you do in your off time? MB: Well lots actually. To be honest it’s just been recently I relinquished the Manager’s hat because I have been doing all of the management for the past 20 years and the tour managing so I’ve really had a hands on the whole deal. I’ve been able to be more creative, write more songs and I’ve got a 7 year old boy who just keeps me busy as hell. I love it – I just take off the Rock & Roll hat and put on the Dad hat and I’m just happy as a man can be. It just brings a complete joy to my life. It’s a busy life but it’s a happy one. The joy and happiness in his life is certainly reflected in his passion for music & creativity as a song writer. Such a pleasure to speak with and would certainly take the opportunity again and again to spend time with such a brilliant man. 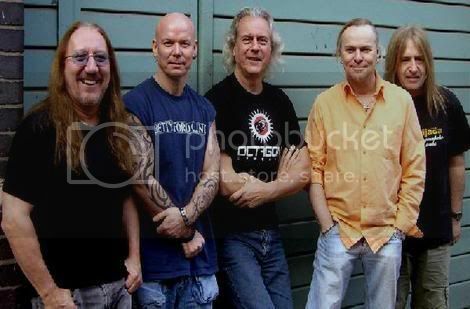 Mick said it – watch their website at “http://www.uriahheep.com” for new tour dates to be posted and you MUST go and see this fabulous group of musicians perform live – you have not lived life to the fullest until you have. Backstage Live Magazine welcomes Uriah Heep into our Rock & Roll family with wide open arms!